Contemporary West End is premier luxury accommodation situated right on the mountainside Aspen. You will love everything about this fabulous property. The spaces are light and airy and a wonderful family house. A morning shower on the top deck in privacy will start the day or just sunning off the masters private deck. The art work and finishing and furniture will please anyone. The house has three bedrooms with private bath. There is a king size bed in this room. There is a washer, dryer, clothesline on this level. 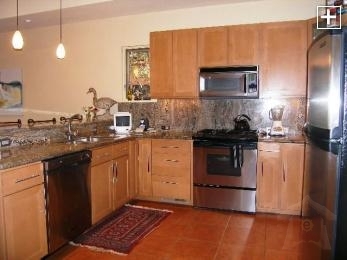 The kitchen is fully furnished with microwave, blender, dishwasher, utensils, coffee maker and refrigerator. Living room and dining room make this the place to entertain. The fireplaces in the living room, media room and bedrooms add to the warmth of your stay. Contemporary West End vacation rental rates $500 per night. Until confirmed, rates are subject to change without notice. This is the house you’ve been waiting for Contemporary West End, Aspen!